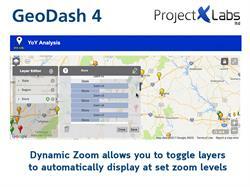 TORONTO, ON--(Marketwired - April 18, 2017) - Project X Labs Ltd. is pleased to announce the release of GeoDash™ 4, our location intelligence tool that is once again redefining the standard for affordable geographic information systems (GIS). 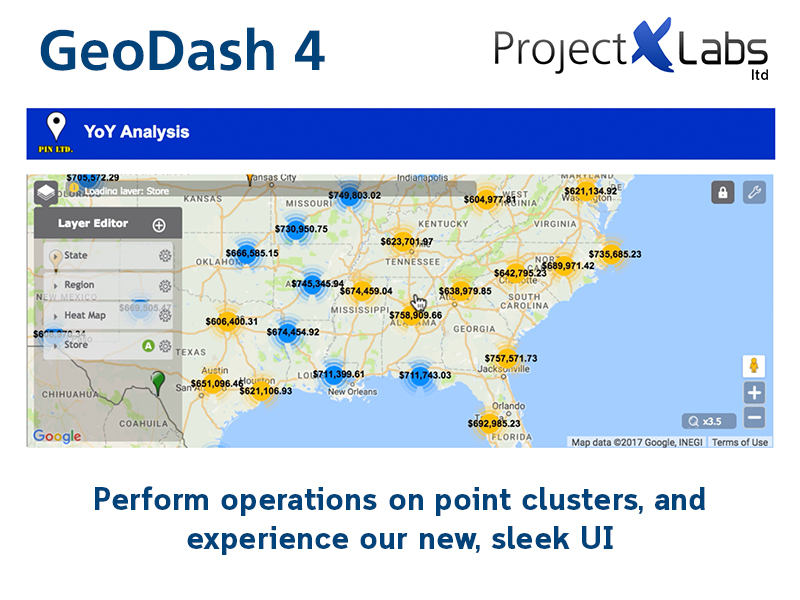 GeoDash is a lightweight MicroStrategy extension for map-based analysis that has been overhauled with new features including an optimized UI, the ability to perform aggregate operations on point clusters, and the introduction of dynamic zoom, allowing users to streamline their analysis by toggling layers to only display at custom zoom levels. 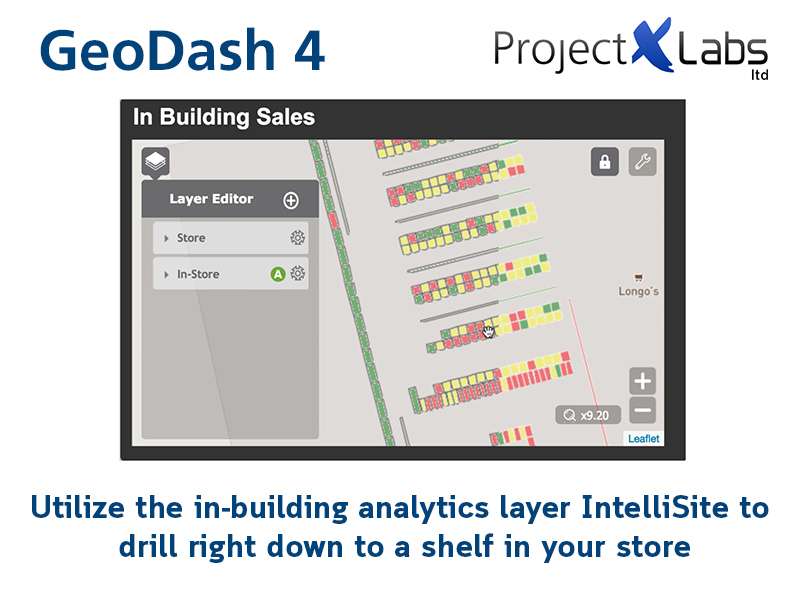 Users can take their visual analytics right down to a shelf in a building with the in-building analytics layer IntelliSite™, which is now fully integrated into GeoDash and utilizes dynamic zoom to display automatically when zooming into a building location. Use a heat map to determine performance within your facility or store to discover insights that will streamline your business practices. GeoDash is fully integrated with the Google Maps API giving users access to powerful features: simply geocode your locations with street addresses, use local search to reveal competitor or affinity locations, and access Street View and current traffic. 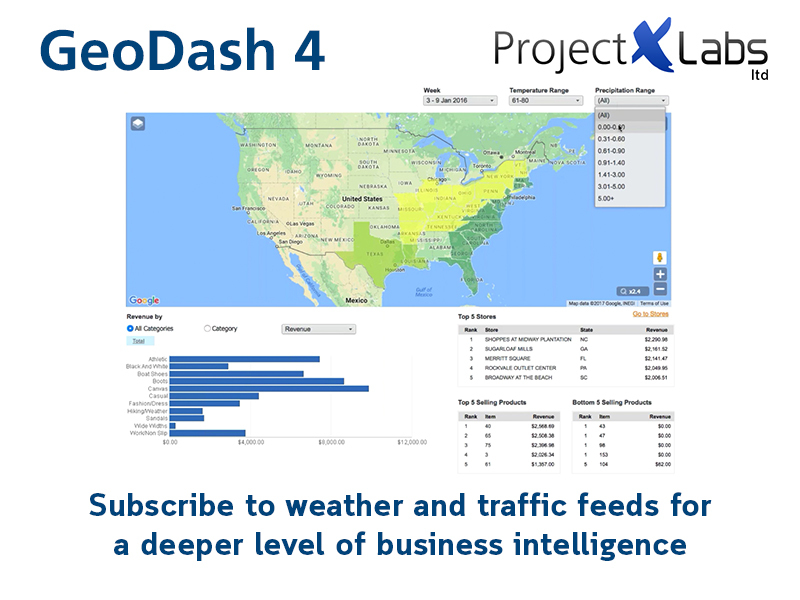 Project X Labs also offers access to new data subscription services including historic and forecasted weather and historic traffic that can be integrated into GeoDash, adding new levels of insight for making important business decisions. 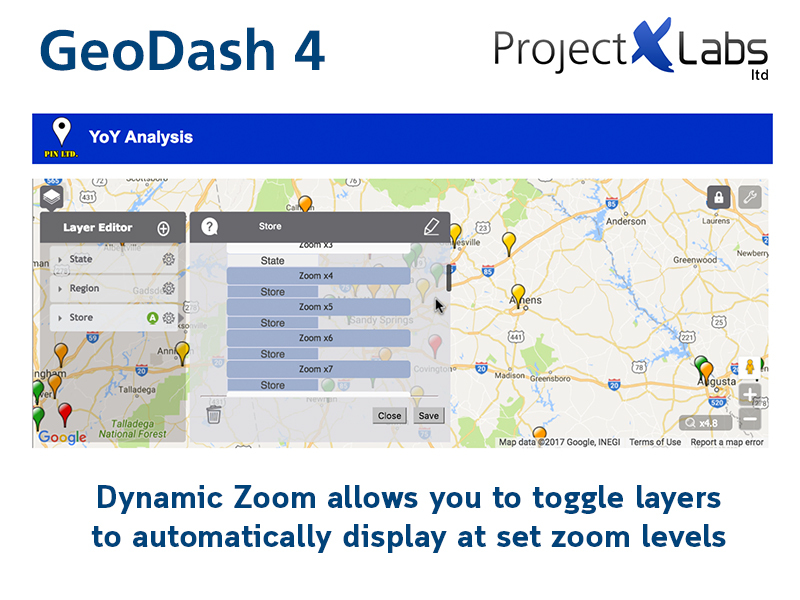 "We are pleased to continue our support of GeoDash as a leading location intelligence visualization tool on the MicroStrategy 10 platform," said Stephen Hayward, president of Project X Labs. "With this release, we have reengineered the platform to make use of the latest advances in the MicroStrategy architecture and maintained alignment with the Google Maps APIs. We are always evolving the product with the needs of different industries and our clients in mind, and have optimized the UI and added requested functionality. Of course, we also squashed many bugs in the process." To request full release notes or to book a demo of GeoDash 4, contact Meaghan Davidson or Jay Borenstein at 416-422-8900 or marketing@pxltd.ca. GeoDash is a lightweight geospatial analytics tool that takes full advantage of MicroStrategy features & Google Maps tools (street view, directions, traffic, local search), eliminating the need for geocoding. Users can create & manage their own shapes (vector) within the tool, or provide shape files and then upload and save them. Users can also use GeoDash's heat-mapping feature to quickly analyze and identify outliers within their data sets. 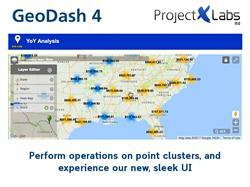 Perform aggregate operations on point clusters, and experience our new, sleek UI. Dynamic Zoom allows you to toggle layers to automatically display at user set zoom levels. 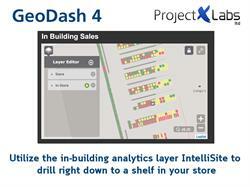 Utilize the in-building analytics layer IntelliSite to drill right down to a shelf in your store or facility. 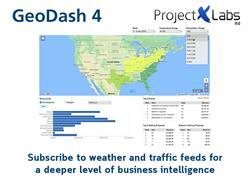 Subscribe to weather and traffic data feeds for a deeper level of business intelligence. Experience the powerful features of GeoDash 4 on our YouTube channel.